AmTab’s Complete Portable Stage Set includes everything you need to accommodate musical performances, speeches and graduation ceremonies. The heavy duty steel frame will provide dependable support for years to come, and the carpeted deck is available in four attractive colors. A built-in coupling system locks 16 8'L x 4'D x 24"H stage units together. When the performance is over, each section folds flat for easy storage. AmTab Portable Stage Sets are backed by a 15 year warranty. Made in the U.S.A.
AmTab’s 24'L Complete Portable Stage Set includes everything you need to accommodate musical performances, speeches and graduation ceremonies. The heavy duty steel frame will provide dependable support for years to come, and the carpeted deck is available in four attractive colors. A built-in coupling system locks 12 8'L x 4'D x 24"H stage units together. When the performance is over, each section folds flat for easy storage. AmTab Portable Stage Sets are backed by a 15 year warranty. Made in the U.S.A.
AmTab’s Complete Portable Stage Set includes everything you need to accommodate musical performances, speeches and graduation ceremonies. The heavy duty steel frame will provide dependable support for years to come, and the carpeted deck is available in four attractive colors. A built-in coupling system locks 12 8'L x 4'D x 24"H stage units together. When the performance is over, each section folds flat for easy storage. AmTab Portable Stage Sets are backed by a 15 year warranty. Made in the U.S.A.
AmTab’s Complete Portable Stage Set includes everything you need to accommodate musical performances, speeches and graduation ceremonies. The heavy duty steel frame will provide dependable support for years to come, and the carpeted deck is available in four attractive colors. A built-in coupling system locks nine 8'L x 4'D x 24"H stage units together. When the performance is over, each section folds flat for easy storage. AmTab Portable Stage Sets are backed by a 15 year warranty. Made in the U.S.A. This AmTab Complete Portable Stage Set includes everything you need to accommodate musical performances, speeches and graduation ceremonies. The heavy duty steel frame will provide dependable support for years to come, and the carpeted deck is available in four attractive colors. A built-in coupling system locks six 8'L x 4'D x 24"H stage units together. When the performance is over, each section folds flat for easy storage. This AmTab Portable Stage Set is made in the USA and comes backed by a 15 year warranty. 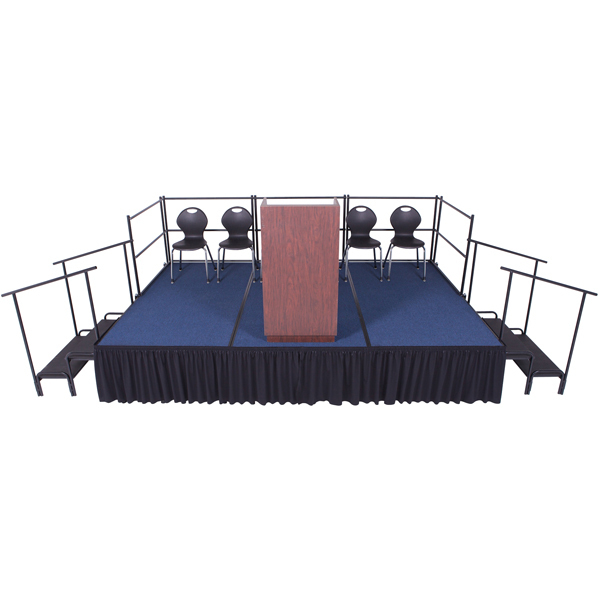 This AmTab Complete Portable Stage Set includes everything you need to accommodate musical performances, speeches and graduation ceremonies. The heavy duty steel frame will provide dependable support for years to come, and the carpeted deck is available in four attractive colors. A built-in coupling system locks four 8'L x 4'D x 24"H stage units together. When the performance is over, each section folds flat for easy storage. AmTab Portable Stage Sets are backed by a 15 year warranty. Made in the U.S.A.
AmTab’s Complete Portable Stage Sets include everything you need to accommodate performances, speeches and graduation ceremonies. The heavy duty steel frame will provide dependable support for years to come, and the deck is available in your choice of hardboard, carpet or polypropylene. A built-in coupling system locks the individual 8'L x 4'D stage units together in fixed-height arrangements. When the performance is over, each section folds flat for easy storage. AmTab Portable Stage Sets are backed by a 15 year warranty. Choose from several sizes. At SCHOOLSin, we work hard to deliver the best value on school furniture to our customers. And when it comes to portable stages, not many can compete with our product knowledge or our number of satisfied customers. So if you have any questions about our school staging equipment, give us a call at (877) 839-3330. A member of our friendly customer service team will be happy to help.